A new campaign has been launched which aims to encourage Britain’s workers to become more active at work in a bid to counter what the World Health Organisation as the fourth biggest killer on the planet – ‘inactivity’. According to research recently published by Westfield Health, the organisers of the campaign, more than 60% of workers are currently deemed to be inactive at work – categorised as being sat down for four hours or more in succession. 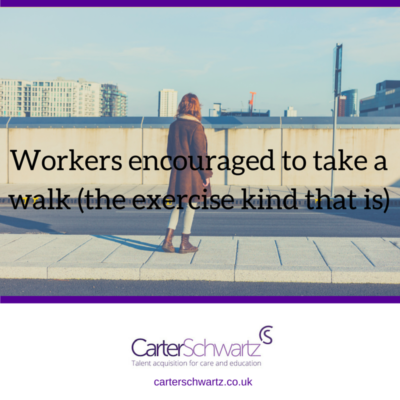 Fronted by TV presenter Carol Vorderman, the campaign aims to encourage employers and employees to take a ‘walking lunch’ for 20 minutes during the working day. Worse still, 16% don’t eat lunch at all despite the fact that 40% of workers who do take a break of 20 minutes or more report feeling significantly less stressed, more motivated and have a clearer head after taking time out of their working day for a short walk. These findings echo those from SimplyHealth and YouGov, which found that of the 4 million British workers who never take a lunch break, it is younger workers (18-24 years) that are less likely to do so than their senior colleagues aged 45 years or over (5%). Romana Abdin, Chief Executive of Simplyhealth, said: “Employees want their employers to establish a culture where taking a proper lunch break is the norm but they need to take responsibility too. “As businesses, we need to encourage and empower employees to take responsibility for making the right choices for them. The authors of the Westfield Health report warn that such a degree of inactivity can not only increase the likelihood of obesity, it can also lead to serious health issues such as diabetes, heart disease and some forms of cancer. “Sitting”, they claim, “is the new smoking”. We all recognise the pressures that many care providers face on a daily basis. But while it may at first seem reasonable to suggest that the more hours we and our teams put in the more we will get out, that isn’t necessarily the case. If employee welfare is being detrimentally affected, what affect will this have on the delivery of effective patient outcomes?